This project will enable 63 refugees, aged 16 -21, to attend the Karenni Further Studies Program (KnFSP) for a year, in Karenni Camp 2 on the Thai/Burma border. The program provides a supportive learning environment where the young refugees can gain essential knowledge and skills for their future. The students will learn subjects such as English, Maths, Science and Social Studies, as well as other subjects like Leadership and Management to build their capacity to take on leadership roles within the community after graduation. In refugee camps on the Thai/Burma border, access to higher education is very limited and previously there was no educational program available for young refugees in Karenni Camp 2. KnFSP was established to meet this need and provide a space for young refugees to continue their education. In addition, through the current resettlement programme, the number of skilled workers has greatly diminished, so this program will help to mitigate against that that gap. The KnFSP runs over two years and in addition to the formal learning there are symposiums, work internships, leadership camp and community service outreach for the students. There is also an opportunity for the young people to be supported by mentors who are already based in community based organisations to provide a real insight into possible career options. Throughout the program, the school will include a women studies component into the curriculum to empower the young women attending, who make up 65% of the student’s population. 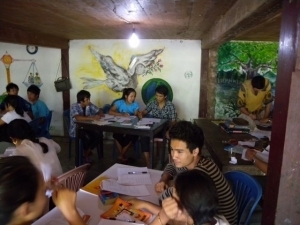 KnFSP is the only education program that offers higher education in the camp for young people aged 16-21 and was established by the community in 2008. It is located in Ban Mae Surin (BMS), otherwise known as Karenni Site 2, in Amphur Khun Yuam, Mae Hong Son Province, Thailand and has a population of approximately 3,500 people. In the last 4 academic school years, there were 66 graduates, of whom 70 percent are now working with community based organizations and schools, helping to mitigate against the loss of staff who have resettled to third countries. This year, the Karenni Further Studies Program (KnFSP) provided support to 61 students and they all passed the final exam. The graduation ceremony was held on March 22nd with 2012 participants including staff, teachers, parents and students. Besides classroom education, KnFSP offered contextualized training in topics such as teaching, conflict solving and methods, and public speaking. The students participate in a mandatory 1.5 month internship at an organization in the refugee camp which this year led to employment for all 26 graduates participating in this program. 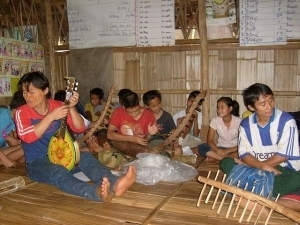 Extra-curricular tasks such as Leadership Camp were conducted so students could explore their own leadership style and strengthen their understanding of youth’s role in community and society building, especially related to Burma’s future.